A robot is a machine that looks more or less a human being. Starwars C-3PO is a golden robot. A robot can also be any man-made automatic device, resembling a human being or not. When you ask for the time on a phone, a robot will answer you. 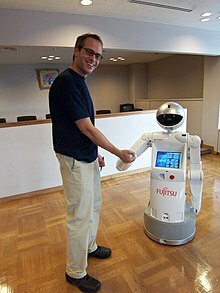 (metaphorical) A robot is a person who does not show emotions and seems to have no human thoughts. He has the same expression whatever happens to him : he is a true robot. This page was last edited on 24 April 2017, at 04:41.